Researchers at Rice University have refined silicon-based lithium-ion technology by literally crushing their previous work to make a high-capacity, long-lived and low-cost anode material with serious commercial potential for rechargeable lithium batteries. The team led by Rice engineer Sibani Lisa Biswal and research scientist Madhuri Thakur reported in Nature’s open access journal Scientific Reports on the creation of a silicon-based anode, the negative electrode of a battery, that easily achieves 600 charge-discharge cycles at 1,000 milliamp hours per gram (mAh/g). This is a significant improvement over the 350 mAh/g capacity of current graphite anodes. That puts it squarely in the realm of next-generation battery technology competing to lower the cost and extend the range of electric vehicles. The new work by Rice through the long-running Lockheed Martin Advanced Nanotechnology Center of Excellence at Rice (LANCER) is the next and biggest logical step since the partners began investigating batteries four years ago. Silicon can hold 10 times more lithium ions than the graphite commonly used in anodes today. But there’s a problem: Silicon more than triples its volume when completely lithiated. When repeated, this swelling and shrinking causes silicon to quickly break down. Many researchers have been working on strategies to make silicon more suitable for battery use. Scientists at Rice and elsewhere have created nanostructured silicon with a high surface-to-volume ratio, which allows the silicon to accommodate a larger volume expansion. Biswal, lead author Thakur and co-author Michael Wong, a professor of chemical and biomolecular engineering and of chemistry, tried the opposite approach; they etched pores into silicon wafers to give the material room to expand. By earlier this year, they had advanced to making sponge-like silicon films that showed even more promise. Even those films presented a problem for manufacturers, Thakur said. “They’re not easy to handle and would be difficult to scale up.” But by crushing the sponges into porous grains, the material gains far more surface area to soak up lithium ions. Biswal held up two vials, one holding 50 milligrams of crushed silicon, the other 50 milligrams of porous silicon powder. The difference between them was obvious. “The surface area of our material is 46 square meters per gram,” she said. “Crushed silicon is 0.71 square meters per gram. 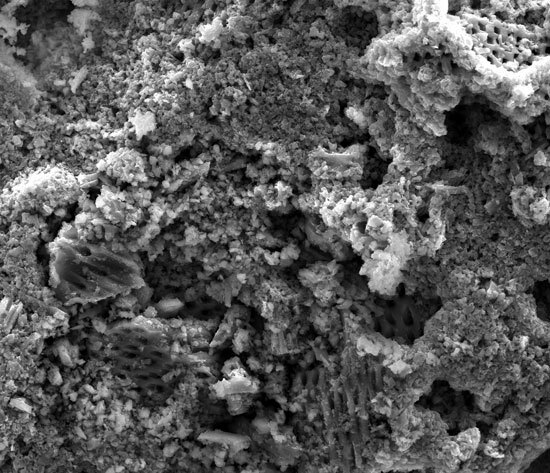 So our particles have more than 50 times the surface area, which gives us a larger surface area for lithiation, with plenty of void space to accommodate expansion.” The porous silicon powder is mixed with a binder, pyrolyzed polyacrylonitrile (PAN), which offers conductive and structural support. “This work shows just how important and useful it is to be able to control the internal pores and the external size of the silicon particles,” Wong said. In recent experiments, Thakur designed a half-cell battery with lithium metal as the counter electrode and fixed the capacity of the anode to 1,000 mAh/g. That was only about a third of its theoretical capacity, but three times better than current batteries. The anodes lasted 600 charge-discharge cycles at a C/2 rate (two hours to charge and two hours to discharge). Another anode continues to cycle at a C/5 rate (five-hour charge and five-hour discharge) and is expected to remain at 1,000 mAh/g for more than 700 cycles.